After seeing the Farm, one should turn to Farm Road, which runs along the park boundary. Fifteen minutes' walk by this road brings one to the Tchihatchevsky Gate, which is always open and which gives access to the town. On the left side of the road, not far from the farm, an avenue branches off to the the Private (Sobstvennaya vetka) Railway Station, belonging to the Alexander Palace. The branch line is connected with all the main railway roads from St. Petersburg. The construction of the pavilion with its branch lines was begun in 1895 and finished in 1909. Immediately beyond the road, leading to the railway station, a church (the Fyodorovski Sobor, seen at left) is being built for His Majesty's Own Life-Guards, and His Majesty's Own Infantry Regiments. 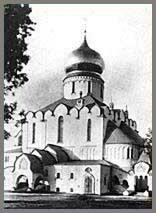 The plans for the church were made by M. Pokrovsky, professor of architecture. The foundation stone was laid in the Imperial presence in the summer of 1909. Beyond The church, at the edge of the broad farm meadows, can be seen the barracks of the regiments just mentioned, and the two buildings of the Imperial Garage; the first consisting of a shed for motorcars, and workshops is of brick in the English cottage style and was erected in 1906 from plans made by the architect Danini; the second, containing lodgings for the chauffeurs, was built in Style Moderne in 1908 by the plans of the architect Lipsky. Across the road from the garage are the officers' lodgings of His Majesty's Own Infantry Regiment, which face Kuzminskaya Street, a continuance of Dvortzovaya Street, onto which opens the Tchihatchevsky Gate at the end of Farm Road. To the left of the gate Kuzminskaya Street is joined by the Moscovskaya, which is planted with an avenue of maple trees; up to 1808 a wall ran down the middle of this street dividing the palace suburb from the fields. At the corner of Moscovskaya and of Dvortzovaya Streets stands the immense building of the Clergy Daughters' School. It was founded in 1843 and was intended for 90 pupils, but in 1883 the number of classes was increased from three to six, and the number of pupils doubled. In 1901 the number of pupils was brought up to 204. All the girls are boarders. The terms of pay vary from 150 rubles a year to 75 rubles for the pupils, who receive help from the government. The course of study corresponds with that of the Mariinsky Girls' College, but foreign languages are not taught. On leaving the school, the pupils receive the right of becoming governesses. In order to give the pupils of the last class practice in teaching, a model parish girls' school of one class only, is attached to the school, since 1903. The establishment is supported by the Synod. 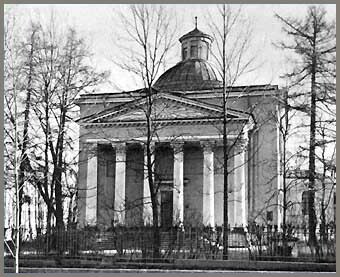 By the side of the school, facing the Kuzminskaya street, stands the Roman Catholic church, built in 1824-26. From 1811-1826 the temporary church occupied a building belonging to the Master of Ceremonies, Commander Maisonneuve (in Hospitalnaya street No. 6). The church was built by a special committee, presided by the General adjutant Count Ojarovsky, from Domenico Adamini's plans, with the funds, supplied by the Emperor Alexander I and by the Imperial Family. The church is decorated in Empire style, which gives the interior a noble simplicity, while the exterior produces even an impression of poverty. On the 24th of June 1825, in the presence of the Minister of Public Instruction and many guests, the foundation stone of the church was laid, and two bronze plates, bearing Russian and Latin inscriptions, were affixed to the stone. In three years the church was consecrated. In 1906-1908, the number of worshipers having considerably increased, the church was made much wider by the architect Danini, but the lack of funds has hitherto prevented the alteration of being definitively completed. There are three altars in the church. The high-altar, dedicated to St. John the Baptist, and two side altars, one of the Agony in the Garden, and the other of the Virgin Mary. The altars are built of imitation marble. Above the High Altar is an engraving in bronze, representing the Beheading of St. John the Baptist, the gift of the Princess Lovitch , wife of the Tsarevich Constantine Pavlovich. Here too is a cross with a coral crucifix. In the vault sepulcher are fifteen graves. In one of the tombs are the remains of the Princess Lovitch, who died at Tsarskoe Selo in 1831. The Catholic Metropolitan and Archbishop, Ignatius Lewis Korvin-Pavlovsky, the Prince Emanuel Nicholaevich Mestchersky, the Count and the Countess Ojarovsky, the Count Julius Litta, and the Count de Laval are buried here. At the corner of the Kuzminskaya and of the Kolpinskaya streets, in the house Nr. 2 is fixed a marble slab with the inscription: "A. Pushkin lived in this house from May 25th till October 20th 1831". Here Pushkin spent the first summer after his marriage, in the society of Yukovsky and Gogol. In this house he wrote: "The Tale of the Tsar Saltan", "To the Defamers of Russia", "The Tale of the Merchant and his Workman Balda", "The Letter of Onegin to Tatiana", and others. In the Tsarskoe Selo Museum is a drawing of the facade of this house, as it was in Pushkin's time. Ten minutes' walk from the Catholic Church, at the junction of the Kuzminskaya Street and of the boulevard which forms the boundary of the town, stands the gate of Kuzmino. Beyond it commences the village of Kuzmino, which is peopled with the descendants of the peasants transferred hither by Peter the Great in order to colonize the territory he had won back for Russia. 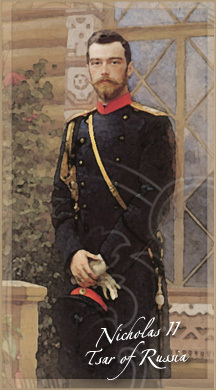 Until the abolition of servitude, Kuzmino formed one of the villages of the Imperial Estate at Tsarskoe Selo. The town was built by the hands of the ancestors of the present inhabitants of Kuzmino. At the actual time its population is about 3,000. The majority of the peasants are quite well off in respect to land, and are mostly cab men or merchants; they even hire out cottages for the summer. 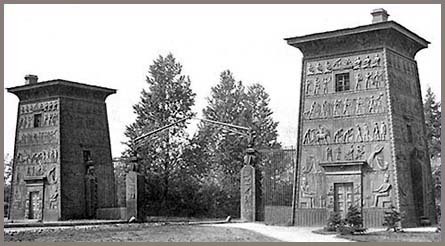 The gate of Kuzmino was built in 1829 in the Egyptian style from sketches by the architect Menelas. The hieroglyphics were modeled by the professor Demut-Malinovsky. The iron gate and the cast iron columns and plates, covered with hieroglyphics, were cast in St. Petersburg at the Alexander Iron Works. The Alexander Park extended to this gate until 1895, when part of it was made use of for the building of barracks. From the gate along the boulevard beyond the town boundaries a new villa settlement has been growing up during the last few years.